Time for some fun. How would you like the chance to win a unique backpack courtesy of Chris Fraley Presents? Chris Fraley is Blackman "saving mankind one stereotype at a time." With the Team Blackman backpack you'll be making a hair raising fashion statement! Through September 29, we'll be posting quotes from our Black History Quotes Express App on QuikthinkingSoftware1 Instagram and Quikthinking Software Facebook. If you know Who Said That, just tell us who it is. No cheating! Black History is not just a February event. Celebrate some of the most memorable quotes from notable African Americans handpicked from Black History Quotes Express. Test your knowledge and answer our daily Who Said That Black History Quote. The person with the most correct answers at the end of the week will get a special shout out and the Team Blackman backpack. Let's have some fun! 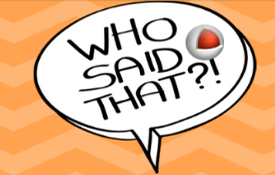 Put your thinking cap on and play Who Said That? !